THE WEEKLY B-MOVIE NIGHT BLOG: Creepiest Midget Ever, and Brando in a Mumu. Creepiest Midget Ever, and Brando in a Mumu. Starring: David Thewlis, Marlon Brando, Val Kilmer. 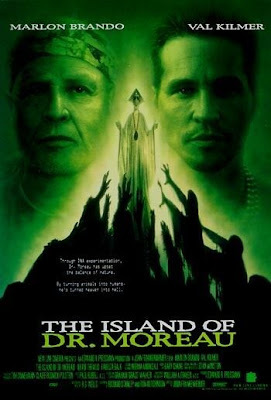 Plot Synopsis: On a remote island in the South Pacific, Dr. Moreau had used the key of science to unlock the gates of hell. Dr Moreau is a brilliant geneticist on the brink of superseding evolution. When a U.N. diplomat visits Moreau's island laboratory, he uncovers fantastic but brutal experiments turning animal life forms into human-like beasts. As Moreau and his assistant race towards their barbaric goal of creating the perfect life form--the beasts revolt--threatening not only the island but ultimately all mankind!